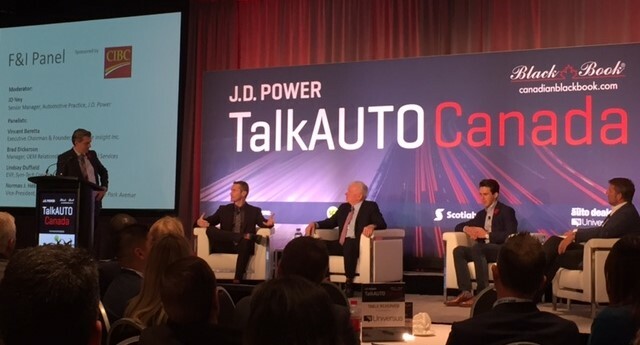 On Wednesday, November 8, hundreds of automotive enthusiasts gathered at the Toronto Congress Centre for the sixth annual TalkAUTO Canada conference, hosted jointly by J.D. Power and Canadian Black Book. This year’s conference theme, “Customer Engagement in a Digital World” meant much of the content focused on the disruptive technologies facing the industry today. The dealer panel in the morning featured high profile dealer representatives from across Canada. The panelists spoke about the importance of restructuring your dealership team to take advantage of leads and noted the higher conversion and close ratio for the used car segment as compared to new vehicles. The panel also featured discussions on the difference between service and sales leads, with participants saying that service leads were often easier and more conducive to immediate follow through. Norman J. Hébert, Vice-President, Corporate Development of Groupe Park Avenue spoke of the success his group had experienced with customer engagement and appointment booking on SMS/text-based platforms. Pictured left to right: Yves Varin, National Director, Business Development, Canadian Black Book (moderator), Shawn Morris, COO, Endras Automotive Group, Susan Gubasta, President/CEO, Mississauga Toyota, Ilya Pinassi, VP Operations, Parkway Motors Hamilton, Norman J. Hébert, Vice-President, Corporate Development, Groupe Park Avenue. The dealers also shared their perspective on e-commerce as a burgeoning part of the auto business and spoke of how a dealer’s online presence functions as a digital showroom. Susan Gubasta, President and CEO of Mississauga Toyota, said she thought there would continue to be a need for in-person interaction when it comes to purchasing a vehicle. The panelists appeared to come to a consensus regarding the importance of still having a physical user experience so consumers can truly understand important aspects of the vehicle such as blind spots. He gave a measured perspective on the buzz surrounding autonomous vehicle technology with his description of the Gartner Hype Cycle, which outlines how the excitement surrounding promising technology can often eclipse the reality of its shorter-term commercial viability. 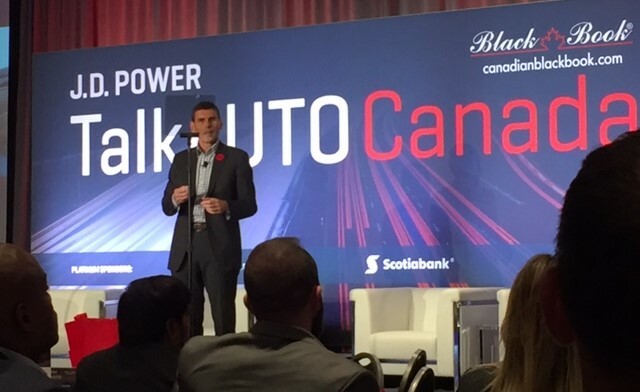 Hutchinson spoke about how governments, insurance companies, manufacturers and associations will have to come together in the coming months and years to bring autonomous vehicles to the mainstream. 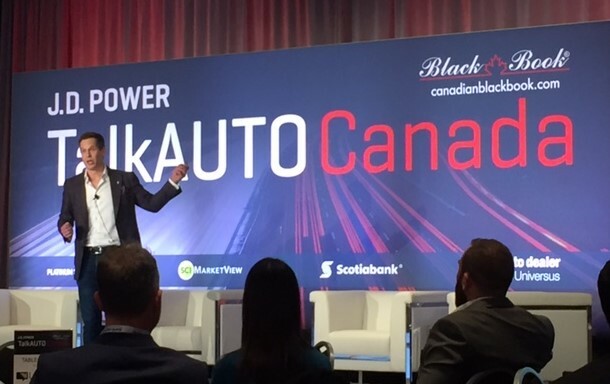 Pictured: Larry Hutchinson, President and CEO, Toyota Canada Inc, addressing the crowded room at the Toronto Congress Centre. He also posed more questions of reflection including, “How safe is safe?” When do we decide it’s okay to roll out this technology to millions of cars? He even drilled down into more everyday considerations, including “Will autonomous vehicles be able to speed?” Many consumers may not have considered the fact that they might be driving the speed limit whether they like it or not. Andrew Tai, Co-founder and CEO of Motoinsight Inc., kicked off the afternoon with his presentation, “Digital Retailing Disruption,” where he spoke about how digital retailing is about much more than e-commerce. He cited the popularity of the Mobile Order & Pay Starbucks app and the success of Loblaws’ “Click and Collect” online grocery shopping service as examples of companies that have been able to turn their physical product offerings into attractive online purchasing experiences. Tai did note that, in his opinion, physical storefronts would continue to be relevant, as evidenced by the fact that online retailer, Amazon, has begun to experiment with the in-person shopping model with their Amazon Go concept. Pictured: Andrew Tai, Co-founder and CEO, Motoinsight Inc. offering insights into digital retailing. One of the most practical takeaways offered by Tai was that an omni-channel digital retailing strategy can transition seamlessly into a tablet-enabled user experience at a physical location. Tai argued that for things like reviewing pricing or payment options, or demonstrating certain vehicle features, a tablet is a perfect sales accessory to help showcase the integration of a dealer’s online and physical offerings. The second panel of the day focused on the financial services industry. LGM’s Brad Dickerson, Senior Manager, Client Strategy, joined three other F&I specialists on stage to discuss everything from the digitization and personalization of selling, the potential of build and price tools on OEM and dealer sites, to the importance of strong regulatory compliance across the industry. Pictured left to right: JD Ney, Senior Manager, Automotive Practice, J.D. Power (moderator), Brad Dickerson, Senior Manager, Client Strategy, LGM Financial Services, Lindsay Duffield, EVP, Sym-Tech Dealer Services, Norman J. Hébert, Vice-President, Corporate Development, Groupe Park Avenue, Vincent Beretta, CEO & Founder, Walkaway Canada Inc.
Much of the conversation focused on how the world of F&I has been slow to evolve alongside other online components of researching and purchasing a vehicle. Dickerson spoke about how that hesitation is rooted in several factors, including budgetary constraints, competing priorities for OEMs, and dealer wariness about having F&I product pricing readily available to consumers during the research phase. 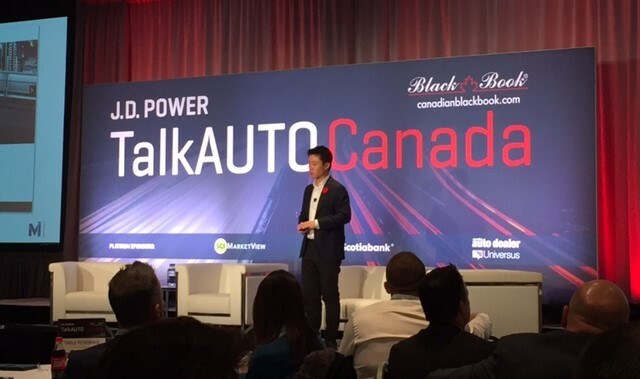 The final speaker and second keynote of the event was Josh Bloom, Automotive Practice Leader at Facebook Canada. He played some of the best corporate advertisements in recent years, and explained why they were so effective in capturing our attention. One of his main messages was that mobile content consumption is changing storytelling narrative structures. Pictured: Josh Bloom, Automotive Practice Leader, Facebook Canada, shows conference attendees the importance of marketing to mobile. According to Bloom, an emerging cardinal rule and “creative consideration” of advertising today is to make sure your commercial is just as enjoyable without sound. Rather than relying on heavy dialogue or catchy music, it’s all about framing your visual story.